It’s official. Egyptian Minister of Defense Abdel Fattah al-Sisi is now Field Marshal Sisi. He is only the ninth Egyptian army commander to be bestowed this highest of military titles. On Jan. 27, the Supreme Council of the Armed Forces had announced Sisi’s promotion, which was made official Feb. 1, and on the same day “empowered” the defense minister to run for president. Undoubtedly, the transition of Field Marshal Sisi from military man to statesman is a risky gamble that will shape the future of Egypt for years to come. Thus, it is no wonder that Sisi is taking his time preparing for his next move. 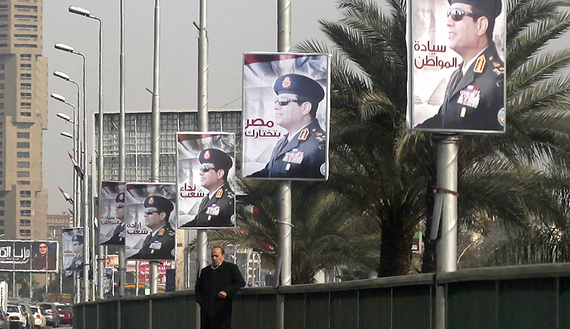 There are five aspects of Sisi’s expected presidential campaign that he has to carefully deal with to make a smooth transition to the world of open politics. This entry was posted in Diary of Aak, Egypt and tagged Coup, Egypt, middle-east, politics, Sisi. Bookmark the permalink.